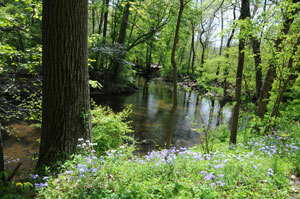 The Pennypack Ecological Restoration Trust began its life in 1970 as the Pennypack Watershed Association (PWA), a grassroots nonprofit organization whose members gathered together to try to improve land use and water quality in the upper and central Pennypack Creek valley of southeast Pennsylvania. At first, PWA was landless, operating out of a storefront office on Huntingdon Pike in Huntingdon Valley, Lower Moreland Township, Montgomery County. In 1973, a regional land trust, Natural Lands (NL) approached the fledgling PWA to inquire about PWA’s interest in assuming management responsibilities for a 26-acre horse farm in Huntingdon Valley that had been bequeathed to NL. PWA and NL entered into a 99-year lease on the farm, including its historic farmhouse, a barn and a caretaker’s cottage, making it the first parcel in a natural area that has grown to over 800 acres. PWA moved its headquarters to the farm, converting the barn to a Visitor Center, the caretaker’s cottage to administrative offices, and the farmhouse to an executive director’s residence. In 1975, PWA adopted a visionary plan for the central Pennypack Creek watershed: the Pennypack Watershed Corridor Study Area Master Plan. The plan proposed creating an undisturbed 855-acre Wilderness Park surrounded by a buffering 800-acre Development Zone in which environmentally sensitive development would be permitted. PWA set aside a significant portion of the Development Zone for the land application of treated municipal wastewater to recharge the aquifer and to minimize the need for central watershed communities to build an interceptor sewer in the bed of Pennypack Creek. A large portion of the 112 landowners within the boundary of the Pennypack Watershed Corridor Study Area were sympathetic and supportive relatives of Pennypack Watershed Association founder Feodor Pitcairn. Another substantial portion of the lands were owned by the West Chelten Corporation, a Pitcairn family-owned investment company. PWA set out to obtain commitment agreements from landowners as soon as the Master Plan was adopted. These commitments were quickly followed by a series of land donations. Over time, there was a gradual shift in the land preservation emphasis for PWA. As increasing numbers of Wilderness Park parcels were coming under PWA control and management, the preserved land was beginning to coalesce into a natural area with enough critical mass to be ecologically valuable. Furthermore, PWA convinced the three municipalities in which most of the Wilderness Park properties were located (i.e., Lower and Upper Moreland Townships and Bryn Athyn Borough) to abandon several little-used public roads through the natural area and to turn those roads into public trails, thereby helping to solidify the communities’ support and good will. In addition, the prospects for the spray application of treated municipal wastewater dimmed with each passing year, so the importance of securing the Development Zone parcels gradually eroded. By 1988, the Wilderness Park encompassed 397 acres, all of which had been donated to PWA. That year marked a turning point for the PWA, which hired David Robertson as the Wilderness Park Director. Dr. Robertson set about redirecting PWA’s emphasis from simple land acquisition to land stewardship and ecological restoration. Henceforth, the organization made a commitment to devote additional resources to deer management and to emphasize invasive plant control and reforestation. That year also marked the end of the period during which the Pennypack Wilderness grew by land donations; with only a few exceptions, land added after 1988 was purchased. For five years after 1988, no new land was added to the Wilderness Park. PWA instead focused on invasive plant management and planting trees. Then, in 1993, two events occurred that reinvigorated Pennypack’s land protection. First, PWA shed its old identity and formally recognized that it had evolved into a conservancy. The organization adopted a new name, the Pennypack Ecological Restoration Trust, reflecting that it had become a land trust focused on ecological restoration. 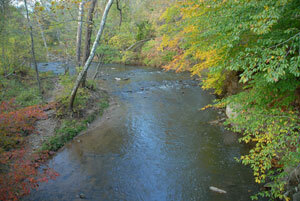 At the same time, the organization renamed its natural area the Pennypack Preserve. Second, two governmental bodies established generous programs to provide support for open space protection. The Pennsylvania state legislature approved the Keystone Recreation, Park and Conservation Fund (Key 93), and the Montgomery County commissioners designated up to $100 million for open space protection. 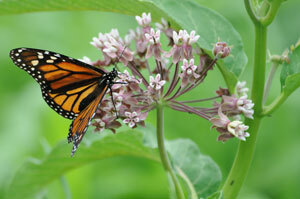 With these changes, Pennypack’s open space protection efforts were infused with new life. After 1988, the Pennypack Preserve more than doubled in size and, of the new 408 acres (as of August 2010), 83% were purchased and only 17% were donated. In 2005, the Trust completed a Strategic Master Plan under the guidance of internationally recognized planners Andropogon Associates, Ltd. 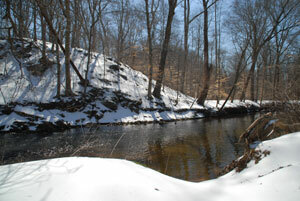 The plan included an assessment of remaining unprotected properties in the central Pennypack Creek watershed that were contiguous with the existing preserved lands. The analysis identified 15 such parcels ranging in size from four to 110 acres. These parcels, totaling about 200 acres, became the focus of the Trust’s protection program. To date, the Trust has protected all or parts of six of these 15 parcels. Little undeveloped land remains to be protected in the central watershed outside the parcels identified, so the Trust’s future land protection opportunities will become increasingly limited.